Customer loyalty is the result of consistently positive emotional experiences that includes the product or services where both work together to deliver superior value. How much value does a loyal customer represent to a company? How does a company secure loyal customers? Here are 40 facts that explain customer loyalty worth and how to make it work for your company. Loyal customers are worth up to 10 times as much as their first purchase. The probability of selling to a new customer is 5-20 percent, while selling to an existing customer is 60-70 percent. 1 in 3 customers will pay more to receive a higher level of service. After the original purchase, the likelihood of a customer making a second purchase is close to 30%, and after they make a second purchase the likelihood of a third jumps past 50%. Increasing customer retention by 2% can have the same impact as reducing costs by 10%. Majority of a customer’s 365-day CLV is realized within the first 30 days as a customer. 65% is realized on day 1, and that grows to 79% by the three-month mark. The cost of bringing a new customer to the same level of profitability as an existing one is up to 16 times more. Consumers spend up to 17% more with companies with excellent service. Millennials are willing to spend up to 21% more with companies for great service. 92% of loyal customers rank price and value as the top driver for loyalty to specific retailers, followed by product/quality at 79% and variety/selection at 71%. 91% of consumers would reward a brand for its authenticity, and 62% say they would either purchase a product from a brand they deem to be authentic or express greater interest in buying from that brand in the future. 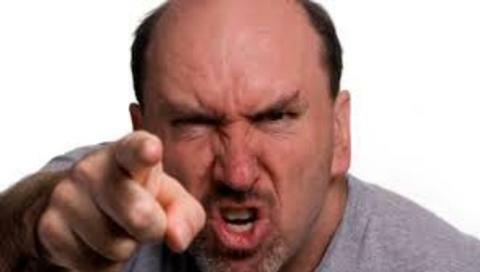 86% of Gen Xers and 85% of Baby Boomers would switch retailers immediately if customer service is poor. 81% of consumers agree that loyalty programs make them more likely to continue doing business with a brand. 81% of U.S. consumers feel loyal to brands that are there when they need them, but otherwise, respect their time and leave them alone. 80% of companies spend less than 30% of their time and budget on customer retention-focused messaging. 75% of companies see a return on investment from their customer loyalty program. 74% of Millennials would switch to a different retailer if they had poor customer service. 73% of customer loyalty club members are more likely to recommend and say good things about brands with good loyalty programs. 71% of shoppers say they would be more likely to use their loyalty cards if they could access these cards and rewards from their mobile phone. 66% of Millennials indicate that they are more likely to shop from stores where they are part of a loyalty program. 63% of U.S. consumers say they’d share more personal information with a company that offers a great experience. 62% don’t believe that the brands they’re most loyal to are doing enough to reward them. 59% of US online adults who are members of a customer loyalty program say that getting special offers that aren’t available to other customers is important to them. 58% of customers join loyalty programs to save money and 38% to receive rewards. 57% spend more on brands or providers to which they are loyal. 56% of high-income consumers feel less loyal to brands now than they previously did. 54% say they would consider increasing the amount of business they do with a company for a loyalty reward. 51% of U.S. consumers are loyal to brands that interact with them through their preferred channels of communication. 50% of consumers said they were willing to give a retailer a second and third chance, with 50% abandoning brand loyalty only after the same mistake was made more than twice. 50% of U.S. consumers said they switched companies they buy from this year because of poor customer experience. 48% say that the most critical time for a company to gain their loyalty was when they make their first purchase or begin service. 42% of consumers distrust brands. 41% of U.S. consumers say they ditched a company because of poor personalization and lack of trust. 39% higher basket size of a customer in company’s loyalty program than a customer that isn’t. 37% of consumers trust brands less than they used to, compared to only 7% who trust brands more than they used to. 29% of customers shop around, but ultimately repurchase from the same brand. 13% of customers are loyalists, who don’t shop around. The average U.S. household has enrolled in more than 18 customer loyalty programs, but is only active in 8.4. Do these facts explain what customer loyalty is worth to you? Do they give you an idea of what your company should do? Are you ready to get started? Chatbots are robots programmed to respond like humans through a computer program and artificial intelligence. It is an assistant that communicates through text messages, a virtual companion that integrates into websites, applications or instant messengers to help businesses give better customers service. The video above explains how. If you’ve interacted with Apple’s Siri, Amazon’s Alexa, Microsoft’s Cortana, and Google Assistant, among others, you’ve used a chatbot. And, if your business is on Facebook, Facebook Chatbots are a free feature show to improve marketing, sales and customer service results. Do they improve customer service for businesses? Are they here to stay? Here are 30 fascinating facts on chatbots and customer service. 75% say they want to know whether they are chatting with a chatbot or a human. 73% of Americans said they wouldn’t use a company’s chatbot after a bad experience. 69% of consumers say they interact with a virtual assistant or chatbot at least once a month. 63% of people would consider messaging an online chatbot to communicate with a business or brand. 61% of consumers believe chatbots are “here to stay” in customer service. 49% of consumers would rather conduct all their customer service interactions via text, chat, or messaging. 48% of respondents prefer a chatbot solve their issue over a chatbot have a personality. 45% of end users prefer chatbots as the main means of communication for customer service inquiries. 42% of consumers already use digital assistants, while 72% of business execs and 53% of millennials are using them. 40% of people claim they don’t care who or what is helping them. 38% of consumers view chatbots positively, 11% have a negative perception of chatbots. The remaining 51% are neutral about chatbots. only 1/3 of customer service interactions require human support. 45% of end users prefer chatbots as the main means of communication for customer service inquiries. 31% of business executives say their businesses get the most impact from virtual personal assistants, more than from any other AI-enabled solution. 27% of the world population is estimate to be using messaging apps and conversing with chatbots by next year. Global chatbot market is projected to account for $1.23 billion by 2025, with a compounded annual growth rate (CAGR) of 24%. 23% growth in the number of users of virtual assistants this year. The use of chatbots will result in cost savings of more than $8 billion annually by 2022, up from $20 million in 2017. Approximately 1.4 billion people use messaging apps and are willing to talk to chatbots. Customers prefer it 29 times over the traditional method. Google predicted that chatbots will have a near human-level lingual ability by 2029. “Hi” and “hello” are the two most popular ways to start a conversation with a chatbot. Other popular messages included a question mark, “hey,” “help,” “yes,” and a thumbs up icon. Xiaoice is a ridiculously popular chatbot in China, The average conversation length is 23 conversations per session (CPS). The average CPS for pretty much every other chatbot: 1.5 to 2.5. Here is an infographic that provides more information why businesses should consider chatbots. Would your business benefit? Customer Experience (CX) is the interaction between an organization and a customer over the duration of their relationship. Customer Experience is measured by the individual’s experience during all the points of contact versus the individual’s expectations. Much research has been done on signs companies should pay attention to help create awesome customer experiences. Here are 55 customer experience facts not worth ignoring. 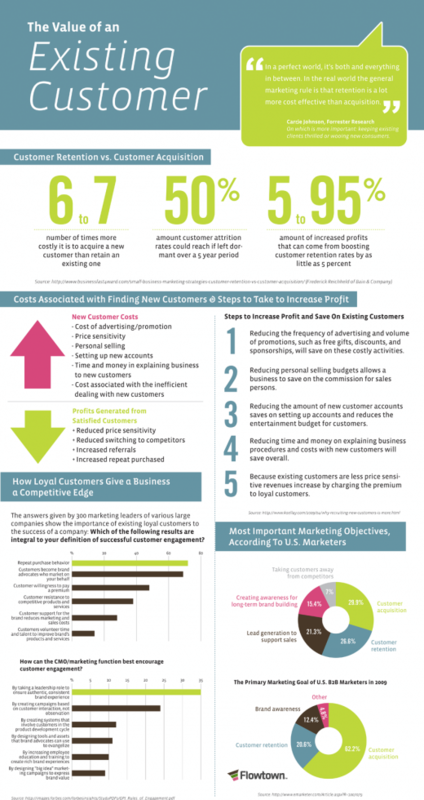 In addition to these facts in print, below is an infographic with many of these key Customer Experience facts in pictures. 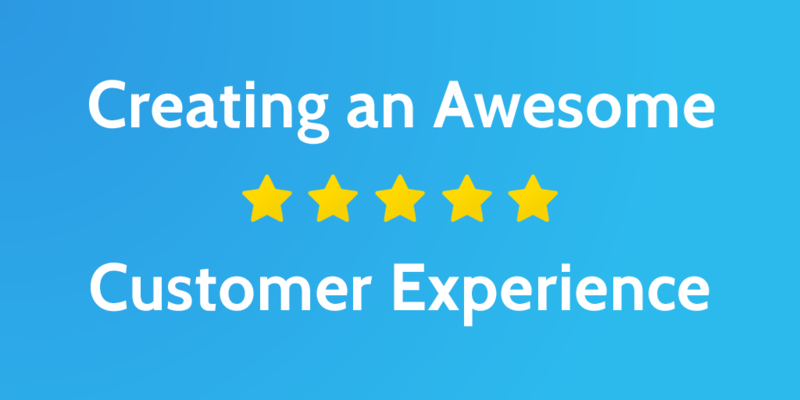 Is an awesome experience worth creating for your customers? Does your business need help improving customer experience? Is customer service a top priority at your company? These statistics indicate it should be. Being consumer-centric is a business strategy; one that places top priorities on having a relationship, earning trust, rewarding good customers and forgetting about marketing. It’s also an investment. How do you prove it’s worth it? And measure it? Key Performance Indicators (KPIs) are business metrics tied to a target. They are used to evaluate factors that are critical to success. KPIs are the actionable scorecard that keep business strategy on track. What are KPIs to track outstanding customer service? Here are 20 consumer-centric KPIs to consider. 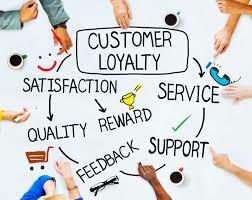 CUSTOMER RETENTION RATE: The number of customers who renew their services or make additional purchases from the company during a defined period of time divided by number of active customers. CUSTOMER CHURN: The number of customers who opt to not renew at the end of their subscription in a given time period divided by the number of customers whose subscriptions end. CUSTOMER SATISFACTION SCORE (CSAT): Outstanding customer service organizations keep a constant pulse of their customer satisfaction (CSAT) score. By giving a simple survey after a customer has completed their experience with customer service, managers gain insights to build and develop their business. NET PROMOTER SCORE (NPS): The number of customers who would recommend your brand to their associates (e.g., friends, family, acquaintances) divided by the total number of customers. CONVERSION RATE: After someone from your customer service team interacts with a customer, how likely are they to make a purchase or take some other kind of action? If your customer service is good, this number should be fairly high. AVERAGE RESOLUTION TIME: If you’re able to keep that resolution time relatively low, that could be an indication of good customer service and another way to measure customer service. FIRST CONTACT RESOLUTION RATE: The number of inbound calls that are resolved on the first contact without the need for transfer or subsequent contacts divided by the total number of inbound calls. AVERAGE WAIT TIME: Even if you do respond quickly to an issue, how long does it take for you to get back to that customer? Measured both by if a customer calls or writes an email. CALL ABANDONMENT RATE: The percentage of inbound phone calls made to a call center or service desk that are abandoned by the customer before speaking to an agent. NUMBER OF COMPLAINTS PER DAY: Number of complaints received from clients by the customer representative staff. ESCALATION RATE: Number of technical or product complaint calls that are escalated from customer service representatives to supervisors/managers for resolution divided by the total number of complaint calls, as a percentage. COST PER COMPLAINT: The total expense (labor, materials, shipping, etc.) for the incident management group divided by the total number of incidents processed. DAILY RETURN RATE: The average daily number of returned products received and processed. ENROLLMENT CONVERSION RATE: The number of customers who choose to enroll in the customer incentive program during a defined period of time (e.g., quarterly, yearly) divided by the total number of customers. REWARDS ATTAINABILITY: The number of reward program participants who redeem accrued reward points/credits during a defined period of time divided by the number of participants who have reward points/credits to redeem. REWARDS ACCRUAL RATE: The value of rewards accrued by the average customer divided by the total purchase amount of the average customer during the same period of time. REWARDS BREAK RATE: The number of accrued rewards that are not be redeemed by members of the customer incentive program divided by the number of accrued rewards available. ANNUAL CUSTOMER VALUE (ACV): The average dollar value of a customer over one year. LIFETIME CUSTOMER VALUE (LCV): The net profit gained from a single customer over the ‘lifetime’ relationship with the good/service/company. This is generally generated by predictive analysis and forecasting because it is used to make longer term revenue projections. CASH FLOW: If your service is bad, it could drive customers away, decrease referrals and cause potential customers not to complete purchases. But if it’s good, customers are likely to come back, tell their friends and have a big impact on your company’s overall profits. Do these KPIs help you measure customer service? 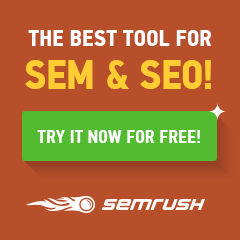 How do you think your business does on these metrics? Do you need help with the metrics to keep the business strategy on track? You get the idea. You can’t be in business without putting the customer first. Customer service is the series of activities that enhance customer satisfaction to keep customers coming back. Some have argued the quality of customer service has decreased in recent years. That it’s due to lack of understanding and planning at the executive levels on the Return on Investment (ROI) of customer service or, more specifically, Return on Service (ROS). Do you think so? Here’s how 12 experts measure the ROI of customer service. 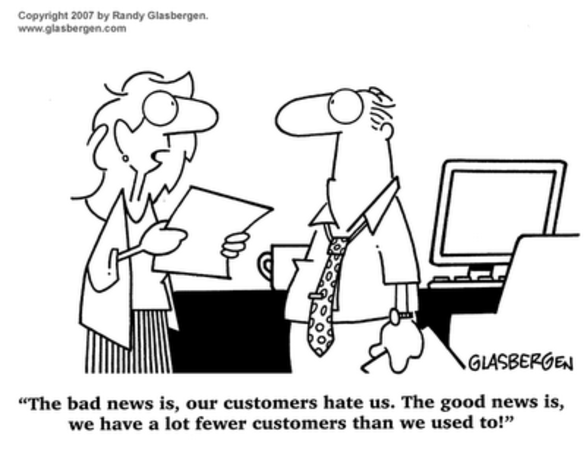 Do you think customer service has decreased in recent years? Do you agree with the way these experts measure Customer Service ROI?